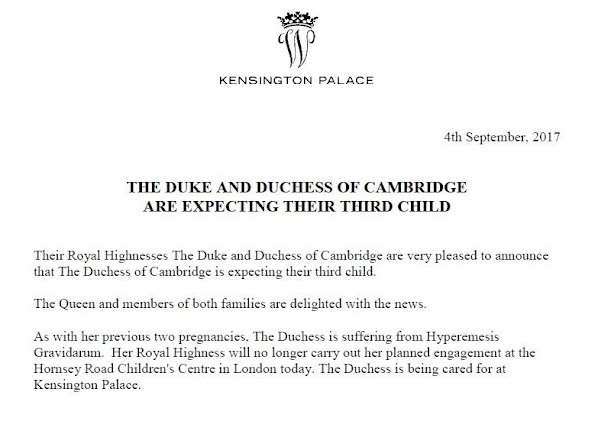 The Duke and Duchess of Cambridge are expecting their third child, Kensington Palace has confirmed. A statement said that the Queen is “delighted” to be expecting another great-grandchild, a little brother or sister to Prince George and Charlotte. "Their royal highnesses the Duke and Duchess of Cambridge are very pleased to announce that the Duchess of Cambridge is expecting their third child," the statement read. Stunning news, im excited. congrats to the Duke and Duchess. Congratulations to William and Kate!George and Charlotte will have a sister or brother.I can 't believe. This is wonderful news! It doesn't say anything about when the baby is expected, but it's probably somewhat early in her pregnancy, maybe they had to announce it because of her condition. Good for all of their family! Congratulations to them! Congratulations!!!! Beautiful news! may the Duchess have an easy healthy pregnancy! What about the engagement that was cancelled? ?did someone replace her?? The engagement was announced last week.if she was not feeling well, at least they could not have planned it.poor children,they deserve better than this inhumane treatment!!!! It looks to me that the children will survive this horrendous drama!! SMH ... a little empathy towards towards the duchess, a fellow woman going thru a rough a rough few weeks, while attending to her first duty, taking care of herself and her child. Inhumane? Please do not throw that word around at something like this. The children may be briefly disappointed but they are fed, clothed and not being tortured, starved or abandoned as are many children today in truly inhumane situations. And I agree with Cherry Blossom, a little compassion for Catherine. Illness is illness. I have some familiarity with hyperemesis gravidarum. If it is not effectively treated, dehydration results, which can seriously harm mother and fetus. Until the dawn of intravenous hydration, women and their babies died. The most famous was one of the Bronte sisters, but there were many others who suffered and paid a horrible price. Chippy 95, of course you didn't say anything emphatic about her, that is exactly what I pointed out your lack of empathy , it seems you don't fully comprehend the meaning of the word, please google and you may learn what it means. Lack of kindness is not a virtue, is just plain and simple trolling. Rolling my eyes and biting my tongue ~ Chippy 95 take a breath. No one is bleeding or dying. Caribbean? Hogwash. You have your stories confused. Agree with you Diane! Fantastic news. Had the same feeling, Diane. Not sure she actually was when she joked about more babies during the tour in Eastern Europe. But the photo of her at Balmoral in August made me wonder. Something in the face of the Duchess when they were at the White Garden made me also wonder if she is not pregnant. Princess Madeleine is pregnant. Happy and the best news with all the gloomy and ugliness on this planet. You feel like jumping!!! Lovely news - congratulations to them. Lovely news! Congratulations to the Duke and Duchess. I hope this hyperemesis gravidarum passes quickly and the Duchess can feel and look as radiant as she did whilst visiting Diana's memorial garden.